Once you have installed a gazebo in your garden you need to ensure that it is properly maintained. While a gazebo does not require a lot of care and maintenance, it does require some basic attention. Each type of gazebo needs its own special handling depending on the type of material it is made from. A vinyl gazebo is the easiest to maintain. You need to clean it periodically with water from the garden hose. You can also use a ladder and brush off the leaves and debris from the roof once a month. Avoid climbing on to the roof of the gazebo as this can damage the roof. 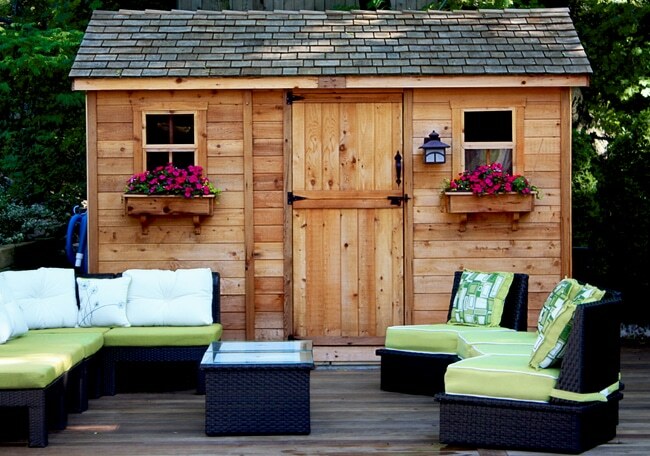 Wood gazebos require a bit of additional care as the wood can be affected by moisture. To prevent this ensure adequate ventilation around the wood gazebo by trimming shrubs and plants away from the gazebo. A wood gazebo can be painted, in which case you will need to repaint it every couple of years. If you want to preserve the wood finish of the gazebo you can either coat it with a clear waterproof sealant or a tinted waterproof sealant. Either option will ensure that the grains of the wood are visible. This is a magnificent way to treat and preserve a gazebo made of pressure-treated wood. The clear sealant will have to be reapplied every couple of years to ensure that the wood is preserved. If you want the wood gazebo to have a beautiful natural weathered look, you can enable it to weather for some time without a sealant and then apply a clear coat of sealant. The roof of wood gazebos too should be cleaned by brushing away the debris and fallen leaves by standing on a ladder. Wrought iron gazebos are almost as easy to maintain as vinyl gazebos. All you need to do is clean it occasionally with a mild soap and water. If you want to maintain its looks, you can also consider coating it with a high-quality polyurethane spray each year. This will keep your wrought iron gazebo looking as fantastic as new for many more family reunions and wonderful events. The screens and frames of the gazebo should be cleaned with water and a mild soap. Dirt can be dislodged using a soft bristled brush. Before you decide to paint, varnish, or spray the gazebo, it is best to remove the screens and frames as any paint or sealant that lands on the screens and frames will not be easy to remove. By removing the screens and frames and washing and drying them separately, you can ensure that they are not damaged when you are carrying out maintenance work on the main gazebo structure. If your gazebo has a cedar shingle roof, you need to make sure that you only brush off the debris from it and do not use high water pressure to wash it since this can dislodge the shingles and damage them. Whatever material the gazebo is made of, you need to clean it regularly from the inside as well. This includes checking the interiors and exteriors for insects, birds, and wasp’s nests and removing them. While insects can be removed using a long handled brush, wasp’s nests need to be handled with more care. For this, you need to first use an insect-specific pesticide and make sure that all of the wasps are eliminated before you attempt to remove the nest. As with all structures, a gazebo needs to be inspected twice a year for signs of cracks and splits, and they need to be fixed before they become bigger. Also the gazebo needs to be inspected for damage after heavy rains, storms, or similar events. This will help you fix any damage as soon as it occurs before a leaking roof can lead to water damage to the floor of the gazebo as well. Routine maintenance of the interior of the gazebo involves removing all dust and inspecting the interior for formation of mold or fungus. In case mold formation has occurred you need to undertake mold remediation and ensure proper ventilation by clearing the surroundings of vegetation to ensure that it remains dry and mold free in future. A gazebo adds beauty to the garden and can be a majestic and serene place to relax in since it conveys protection from the sun and wind while still letting you enjoy the outdoor views, fresh air, and sunlight. However, its exposure to the elements can make it susceptible to damage unless you take a few steps to preserve and maintain it. Most gazebos are constructed from materials that can withstand the elements, but do require some help from you to ensure that it lasts for many more Christmases and spring seasons.